Nine four-thousand meter mountains on the rope of a mountain guide. Moderately difficult high tour in the endless ice. The tours are not difficult but require secure iron walking and good physical condition. After a few days, we will be acclimatized and we can enjoy a great overnight in the Margherita Cabin. Only three people per mountain guide. 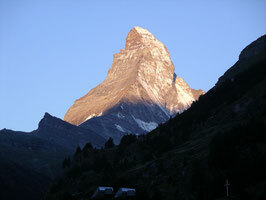 Meet at 8 am: KL Matterhorn train, Warm up tour Breithorn, 4164 m, 2 hour descent to the new Val-d’Ayas Cabin, 3420 m, 2 hours. Castor, 4228 m, 3 hour descent to the Sella Cabin, 3585 m.
Over the Naso to the Balmhorn, 4167 m, Schwarzhorn, 4321 m, to the Vincent pyramid, 4215 m, 5-6 hour descent to the comfortable Mantova Cabin, 3500 m.
Parrot Peak, 4432 m, 3 hours, Signalkuppe, 4559 m, 2 hours and overnight in the highest Cabin of Europe (Cabana Margherita, 4559 m). 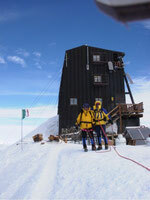 Zumsteinspitze, 4563 m; 1 hour descent over the Grenzgletscher to the Monte Rosa Cabin, 2800 m, 3 hours. End of a adventurous week and return home. ·4 overnights including two meals in the mountain cabins. Beautiful combined high tour week in one of the greatest tour areas of Switzerland. Good physical condition for 3-5 hour climbs and secure walking with iron are required. Only three people per mountain guide. 9 am meet at the valley station of the gondola in Fiesch. Drive to Kuehboden 2200 m and walk to Maerjelensee. Climb to the high above the Gr. Aletsch Glacier located Konkordia Cabin, 2840 m. An ideal warm up of about 4 hours. Gr. Gruenhorn 4043 m, 4-5 hours. Descent to Finsteraarhorn Cabin, 3050 m.
Fiescherhoerner, 4048 m and 4025 m, 4 hours. As a high light of this high tour week, we will climb the highest peak of the Berner Alps, the Finsteraarhorn, 4273 m, 4 hours. Descent over the Fiescher Glacier to the wildly romantic Fieschertal 5-6 hours. Final drink and end of the week. ·Four overnights including two meals in the mountain cabins. A high alpine glacier trekking for everybody away from the crowds. Experience the impressive mountain and glacier landscapes between Val de Zinal, Valtournache and Zermatt. Good physical condition for climbs between 4-6 hours are required for this tour week. Meet at 10 am a the train station Visp. Ride together to Zinal. Climb to Cab. Mountet at 2886 m, 4 hours. 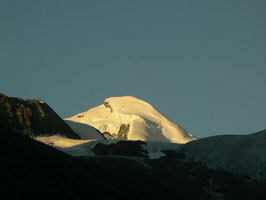 Across the Glacier Durand we will climb to the Point de Zinal, 3789 m in about 3-4 hours. Breathtaking view of the “big ones” of the Alps: Dent Blanche, 4356 m, Ober Gabelhorn, 4062 m; Dent d’Herens, 4171 m and Matterhorn, 4476 m. Descent to the comfortable Schoenbiel Cabin at 2694 m.
Today we will start with a short descent to the Zmutt Glacier. In about 4-5 hours, we will reach the Col de Valpelline at 3568 m. Descent across the Col de la Division to the new Rif. Aosta at 2781 m, at the south side of the Dent d’Herens, 2 hours. Descent to the Rif. Prarayer at 2005 m. Lunch break and then climb to the new built Rif. Perucca-Vuillermoz at 2909 m.
Today, we will climb about 2-3 hours across the new climbing path down to Breul-Cervinia, 2006 m. Lunch together and using the gondola, up to Testa Grigia, 3480 m. Short descent to the Gandegg Cabin. Overnight in this comfortable private cabin at 3030 m.
By train to the Kl Matterhorn, 3820 m. As a nice finish of this week, we will climb the Breithorn, 4165 m in 2-3 hours. Descent to Zermatt and end of a adventurous tour week. Return home. ·Mountain guide for six days. ·5 overnights including two meals in the mountain cabins and bed and breakfasts. This week represents a choice of the most beautiful, moderately difficult tours. The climbs are not difficult, but we will be moving constantly in high alpine combined areas. A little experience in mountain and ice climbing as well as good physical condition are required. Only three people per mountain guide. Meet at 8 am in Saas Grund (Ski gondola station Hohsaas). Weissmies 4023 m. Easy but very scenic climb. About 3.5 hours. Fletscherhorn 3996 m, 4-5 hours. Descent to Weissmies Cabin. Lagginhorn 4010 m; 4 hours combined tour on the lowest 4000 of Switzerland. Descent to the valley and ride to Zermatt. Ride to Kl Matterhorn 3820 m. Breithorn 4164 m, Pollux 4092 m, 4 hours. In another ½ hour we will reach the comfortable Val d’Ayas Cabin, 3420 m.
Castor 4228 m. Exiting snow and ice tour. Descend to Zermatt and return home. ·Four overnights including two meals in the mountain cabins and in the hotel. The Four-thousands of the Saas valley are amongst the most beautiful mountain formations of the Alps. Informative training and tour week. Because of the small groups, the program can be tailored to the individual’s needs. Also ideal for people that have none or only little experience in mountain climbing. Good physical condition to be able to climb for 3-5 hours is required. Meet at 8 am in Saas Grund (Gondola station Hohsaas). Climb to Weissmies Cabin, about 40 minutes. Cliff and glacier training near the cabin. Taught will be different knots, how to tie the knots, orientation material. Fletschhorn 3996 m. Interesting snow and ice tour of about 4-5 hours. Weissmies 4023 m. Easy climb, but beautiful scenery. 3-4 hours. Descent to Saas Grund (tourist camp). Climb to Allalin 4027 m, 2 hours. Overnight at Britannia Cabin 3030 m.
Strahlhorn 4190 m, 5 hours. The longest 4000 m mountain of the week. Descend to Britannia Cabin and Felskinn. Ski gondola to the valley. Return trip home. ·Four overnights with two meals included in mountain cabins and tourist camps. Unsere beliebten Norwegen Sail -and Ski Tourenwochen mit einem Segelschiff werden nun seit 25 Jahren durchgeführt. Im Frühling 2019 sind wir wieder die ersten 3 Wochen im April in Tromsö / Molde unterwegs. Ab mitte Mai sind wir wieder wöchentlich unterwegs. In jeder Woche hat es noch einzelne Plätze frei. Für die genauen Daten / Preise schauen Sie bitte auf unsere Homepage.